One of the most terrifying epidemics of the modern era isn't among humans at all. It's a deadly fungus that attacks bats in the Americas, and it has an almost 100 percent fatality rate. A bat extinction could destroy humanity, too — but some scientists think there's an unusual solution on the horizon. Like bees, bats are a crucial node in many food webs. Many of them eat nectar, and they help fertilize crops as they move from flower to flower. Other bats eat the insects that prey on crops, keeping plants healthy. 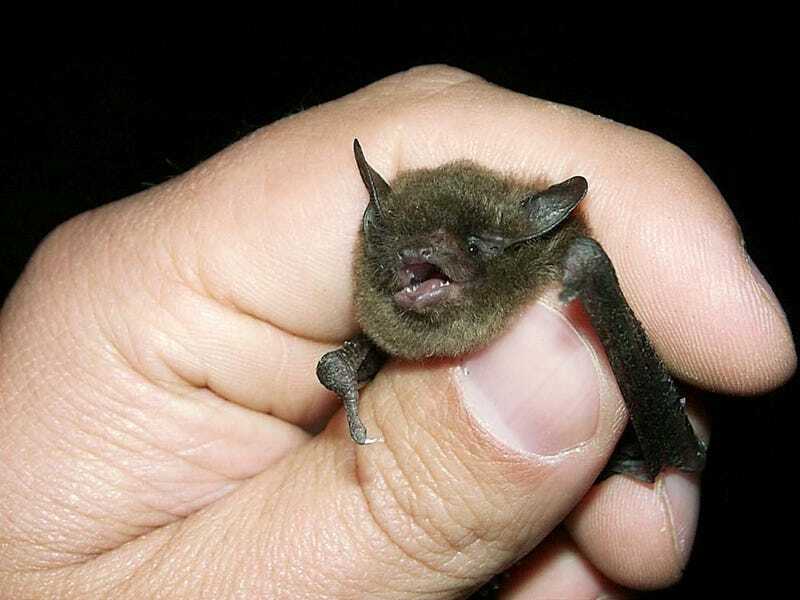 Now, a fungus has been spreading throughout bat habitats, which causes white nose syndrome in the tiny mammals. Millions of bats have died over the past decade. If bats are wiped out entirely, it could dramatically undermine the health of many of our favorite food crops. But possibly, we can use take our cues from a burgeoning scientific field, synthetic biology, to change the game. What if we could prevent the spread of the deadly fungus using biology, rather than some kind of pesticide? Bats are unsung partners of humans; by eating insects and pollinating various plants, bats contribute an estimated $23 billion annually to US farmers, equivalent to roughly5 percent of America's total food crop revenue. Hundreds of predominantly rural counties in the United States each receives benefits worth between $20 million and $75 million annually from insectivorous bats. Tragically, bats in North America are being decimated by white nose syndrome, with nearly six million deaths as of mid-2012 and a mortality rate reaching 100 percent. The syndrome, caused by a fungus evidently imported from Europe, will eventually not only increase food costs but will increase downstream costs due to pesticide application and exposure. Moreover, the cost to replace the bats, assuming we could do it, is likely to be more than $23 billion, because whatever we invent is unlikely to be as efficient as the bats. What might we do to assist bats, hold pesticide use in check, and thereby keep food prices from rising due to an ecological threat? Microbiologists are already exploring biological controls in the form of microbes that inhibit the fungus, which may be useful as a form of pest management but would also increase the evolutionary selection pressure on the fungus to improve its survival skills. Consequently, it is important to explore long-term solutions. European bats are resistant to the fungus, and one option is to introduce the appropriate European genes into North American bats via standard breeding. But bats breed slowly, usually only having one pup a year and only five or so pups in a lifetime. Given the mortality rate due to white nose syndrome, breeding is probably too slow to be useful in near-term conservation efforts. The fungus itself is robust and persistent in bat caves, suggesting it may be hard to suppress or eradicate in the wild. It is possible, however, that synthetic biology could be used to intervene in some way, either by directly attacking the non-native fungus or by interfering with its attack on bats, thereby benefiting both biodiversity and food production. Carlson reports on a recent conference that brought together conservationists and synthetic biologists to discuss how advanced genetic engineering techniques could be used to preserve nature. It's a fascinating idea; Frankenstein may save the world rather than destroy it. Read the whole article over at The Bulletin of the Atomic Scientists.